Mountains, local islands, tug boats and kayakers are all part of the view along the way. Gibsons is a short hop from the ferry terminal along the coast and sits right by the ocean. Residents and visitors alike can enjoy beaches, parks and cafés while taking in the natural vistas. 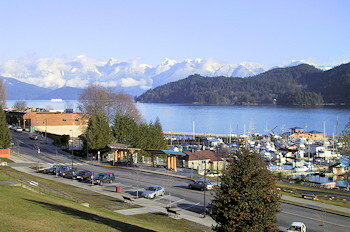 Gibsons is a beautiful town and we can show you - better yet you can see for yourself from the top of Soames Hill. Hike up Soames, take in the view of Gibsons, enjoy a picnic, and soar with the eagles! The fresh air, small town ambience and casual lifestyle have convinced many to visit, and move to Gibsons. Forestry and fishing were once the Town's economic backbone but tourism and retirement are emerging as growth sectors. Close to Vancouver, yet a million miles away, Gibsons is the perfect place to enjoy life to the fullest. 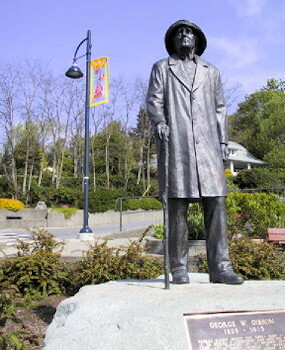 Upper Gibsons has a number of shopping malls, restaurants, and services located on Gibsons Way and Lower Gibsons is a quaint fishing village with bakeries, cafes, and shops that surround the bustling fishing wharf, a seawalk and the Gibsons Harbour. In Lower Gibsons, you'll find a new log wharfinger building and boardwalk over the breakwater, along with the development of the Winegarden Waterfront Park. to Resorts, Lodges, Cottages and Cabins. Come prepared for fun as you explore the scenic parks, beaches, and trails. You can also kayak to Keats Island for a picnic, swim in the clean ocean water, hike the trails, catch a play at the Heritage Hall, buy fresh seafood on the docks for your dinner, stargaze from the beach. Gibsons is full of friendly people and super natural surroundings. The newest park is located on the waterfront in Lower Gibsons and looks out to the harbour, Keats Island, Gambier Island, Howe Sound and the mountains. Relax and enjoy ponds, pathways, streams, woods and beautiful plants and trees. Gibsons enjoys a mild year-round climate with extremes moderated by the maritime influence. Winter months may be frosty with occasional snow, with days that are often cool, sunny and bright. Summer is warm with generally sunny skies, and it's rarely hot enough to be uncomfortable. Make the trip from Vancouver or Whistler. Take Highway 1 from Vancouver or Whistler to Horseshoe Bay and then board the ferry for Langdale. After landing in Langdale, turn left and drive along the coast to Gibsons. The Sunshine Coast is also accessible by air and motorcoach service. 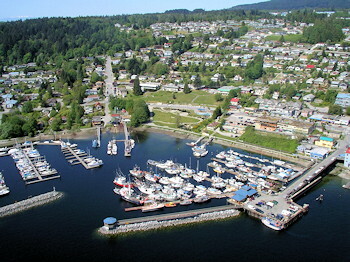 Moorage for private boats is available in Gibsons harbour on a first-come, first-served basis. Gibsons Marina also has moorage. Join us for the Jazz Festival in June, the Outrigger Canoe Races in July, the Fibre Arts Festival in August and the Fall Tune-Up Relay road race in October.